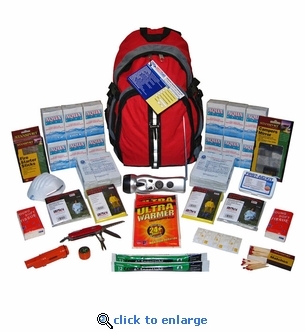 Be prepared for any outdoor catastrophe with this 2-Person Premium Backpack Survival Kit. �This mobile emergency kit features 3 days worth of food and water (the same supplies used by disaster relief agencies) and contains the supplies you'll need for an emegency. Fits inside a heavy duty backpack for easy transport while evacuating. Also great for camping, hiking and other outdoor activities. 1 - Packaged in Heavy Duty 4-Pocket Hiker's Backpack.